"Just don't take too long to die. Be a gent and convenience everybody and do it soon." 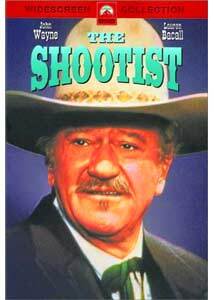 John Wayne made an astonishing 69 Westerns over his long career, and The Shootist is the last one. In fact, it's the last film the Duke made at all. Suffering from lung cancer for years, he was weakened and ill, but when he read the script for this movie, he lobbied hard for the title role of the dying gunslinger who has outlived his time. John Bernard Books (Wayne) rides into Carson City, Nevada in January of 1901 to get a checkup from his old crony Doc Hostetler (Jimmy Stewart). Unfortunately, the back pain that Books has been suffering is advanced cancer. He has maybe a few weeks to live, and he decides to spend them at the boarding house of the widow Bond Rogers (Lauren Bacall) and her son Gillom (Ron Howard). But when word gets out that he is the notorious gunslinger J.B. Books, the riffraff of the town come gunning for him. While he is trying to spend his last days in peace, faro dealer Jack Pulford (Hugh O'Brian), lowlife punk Jay Cobb (Bill McKinney) and vicious killer Mike Sweeney (Richard Boone) are all out to either get revenge or make a name for themselves. In the meantime, there are plenty of others who want to make money off of Books' notoriety, such as publisher Dan Dobkins (Richard Lenz), who are content to make up lies about his career. Troubled Gillom falls under Books' wing, and Mrs. Rogers reluctantly begins to like Books, despite her dislike of his violent past. But Books also has a notion of how he might just die with his boots on rather than screaming in pain in a bed. Wayne is outstanding in his final role. His lengthy career allows a series of film clips at the beginning of the movie that purport to recount Books' career. These clips help point up the iconic status of Wayne, as if we needed a reminder. He is excellent in this role, although he has to stop and catch his breath mid-line on occasion. He still is in command of nearly every situation, and provides a brilliant picture of the dying gunslinger who is stuck in the modern world that really doesn't have any place for him except as a legend. Bacall is good as the rigid widow who gradually melts a little (but not a lot, keeping a healthy reserve between her and Books). Ron Howard is typical Opie, overenthusiastic to a fault. Harry Morgan is hilarious as the local marshal who is first terrified as he comes to run Books out of town, then jubilantly gleeful when he hears that Books is dying. He reappears a couple more times primarily to demonstrate his satisfaction in Books' coming death. John Carradine has an amusing but small part as Hezekiah Beckum, the undertaker who wants to exhibit Books' corpse at fifty cents a head. Jimmy Stewart is shaky as the aged doctor; he seems almost as close to death as Books. Director Don Siegel (Dirty Harry, among others) keeps the action going at a good clip, emphasizing the blood and gore of the gunslinger's life. Whenever the guns start firing, you don't get a discreet or modest kill as in the stereotypical Western; this is real Peckinpah red-gouting violence that sharply contrasts the modest and quiet lives of civilians like Mrs. Rogers. This underlines Books' sense of being out of place, just as does the newspaper relating the death of Queen Victoria that he keeps reading over and over. Just as she had outlived her time when the 20th Century dawned, so had Books. The future was one of streetcars, horseless carriages, and polite society—no place for him any longer. The script is very well-crafted. Nearly every line has a significance beyond its own terms, either in irony or reflected in the closing act. Although the original book has a rather different ending, the screenplay provides a more satisfying coda to Wayne's career, if not the film itself. The film is even more enjoyable on a second viewing, as the significance of the parts becomes clear and the final day is evocative of the prior week and Books' career as a whole. If you have any liking at all for John Wayne, this is a performance not to be missed. Even those who don't much care for him will find a lot to like here. Image Transfer Review: The anamorphic widescreen picture at first glance appears to be a faded master; colors generally look dim and greyed. However, close examination makes it clear that this is an intentional subduing of color, perhaps symbolizing the pacification of the West. The blood (and Books' pillow swiped from a brothel) are bright and vivid red, and the sky is a pleasing blue. There is some minor speckling and noticeable grain throughout. The black levels are lacking in depth and solidity, and there is not much in the way of shadow detail. Skin tones are generally quite good, however. Audio Transfer Review: The English 2.0 mono track seems to have much better depth and clarity than the 2.0 French mono track. Hiss and noise are at very low levels and are not distracting. The English track has good depth and range for mono, and does not suffer from distortion or clipping. Bass is adequate, though not impressive. Extras Review: Aside from a trailer, the only extra is a documentary about the film, consisting largely of interviews with one of the producers and the son of the author of the book on which the film was based. However, they have a good deal of information to impart in their 18m:22s. They tell how the project was brought to Wayne, and the cast assembled (originally, George C. Scott was slated to play Books! ), the ending developed, and how the film was marketed. A small amount of time is spent on the weak reception the film received initially, and the growing esteem that it has accrued over the years. All in all, an excellent little documentary with good content. Paramount is coming along nicely with extras. One of John Wayne's best performances, supported well with a superb cast. The transfer isn't the best, but there are some interesting extras. Definitely worth a look.